I’m happy to announce a fun sewing challenge that we’ve planned for 2018! 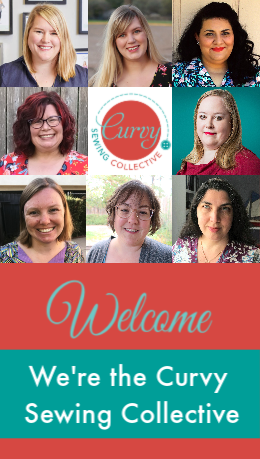 Our editor and contributor team have designed the Curvy Year of Sewing to build community and challenge each other to create items coinciding with bi-monthly sewing prompts. With each prompt there will be pattern suggestions as well as pattern reviews and inspiration on the CSC blog. Use this year long challenge to motivate you to sew, fill in empty spots in your closet or create a capsule wardrobe. You can join in and sew all year or just sew along with the bi-monthly categories that interest you. We’ve tried to be thoughtful and inclusive with this challenge and welcome anyone who wishes to participate. 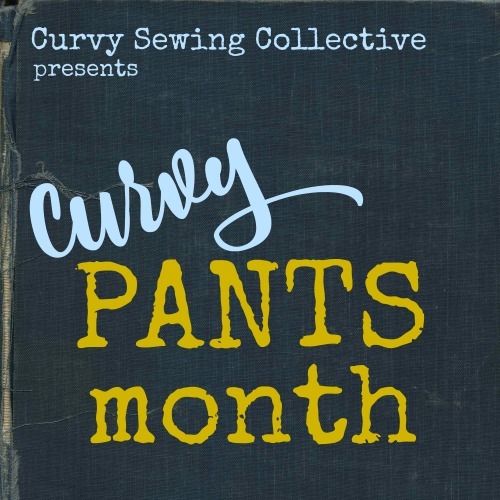 The #CurvyYearofSewing is a year long sewing challenge with bi-monthly sewing prompts. You can sew your choice of pattern as long as it fits in with the category. 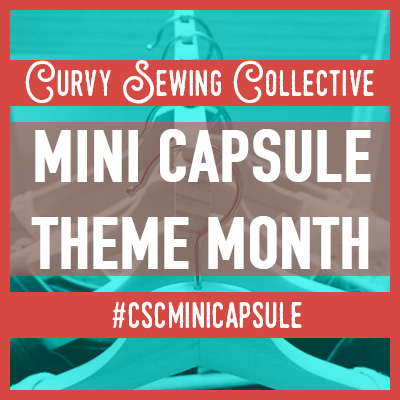 Sew a garment (or accessory) that fits the theme for each two month period and share what you’ve sewn by the end of the second month using the hashtag #CurvyYearofSewing on Instagram or in our CSC Community Group on Facebook. Do I have to sew a specific pattern? No. You can sew any pattern that you wish as long as it fits into the garment type for each bi-monthly period. What if I started a jacket months ago and just finished it? Can I still present it in the challenge? Love that you started with pants! The one garment I always put off to the last because I don’t want to be bothered with fitting issues. Last year I only made PJ pants and a pair of roomy palazzos. I’ve started working on fit by altering (the absolute WORST sewing task ever invented) 4 pair of RTW pants I was about to toss. I’m using them to guide my me-made pants. I’m determined to make a pair of jeans for this challenge, however, I starting with a pull-on fitted slack. Convenient as I have to make my daughter a couple of pairs of fitted trousers that can be dressed up or down to take on a holiday to visit family. I usually make her palazzo trousers as she prefers them loose (great for travelling) but not so easy to dress up. So this has come at the right time and gives me an added incentive to make them fit. As she is an hour glass figure while being a larger size and petite fitted looks better but the basic pattern can be a pain to draft. Look forward to showing the finished product. I would love to participate but with Jeans and Pants being the first item, I am defeated before I even start. Jeans and pants are traditionally a challenge for even the expert sewer. I know there will be a supportive community and events throughout the month but I’m afraid it will discourage pant novices to continue with the challenge. I would rather have started with something like a shirt or blouse for confidence building. Just my opinion. This is very intimidating for me, too. I’d love to start with a blouse. I love the idea of this for a year, would be so great if someone hosted something like this to build confidence for beginners. The Curvy Year of Sewing is meant to challenge us to try something we may not have attempted before. You’re welcome to participate in any theme that will work for you as you don’t have to participate in every bi-monthly prompt. “I’m in”. I am looking forward to learning a lot! I have only sewn basic children’s clothes in the past. This group has inspired me to learn how to make clothes for myself, I am so excited! Is this all we do to join? Yes, just sew and share! I’m going to try to do both, but not sure if I will finish all of the HSM! Sounds super exciting! I was wondering if I’d find a new cool challenge this year, and now yes! Now to chose a trousers patterns and make a muslin! Yay! February will be my personal Pants Month as I try to make the Ames jeans and two other pairs of pants for SWAP 2018. I love the idea. It seems weird to sew jackets right before the warm seasons and to sew swimsuits half way through summer. I was thinking the same thing. All the challenges are a month behind when we should be making them. For those that live in the Northern Hemisphere. Were it me, I would move extras and accessories to November / December, when people tend to be busy with other things anyway, and move the whole second half of the schedule up a slot. But there’s also something to be said for sewing something and then wearing it the next day. The challenge is not seasons based. We have readers in all areas of the world, so please don’t forget that different hemispheres experience different seasons at different times. Yeah so happy you’re doing this😊 Can’t wait to participate! Thank you so much to the Curvy Sewing Collective for putting this together! What a great start to the year! I’d love to see a Pattern Throwdown starring JEANS! It would be kind of epic, because jeans are a lot of work, but it could be an awesome resource! Happy New Year! Nice plans and I’m definitely in. Prewashing denim for my Ames jeans as we speak!